Legit Reviews jumped onto the 4K bandwagon back in 2013 with the Sharp PN-K321 32-inch class 4K LED-Backlit display. At the time this monitor was around $3500 and the display defaulted to 30 Hz, which meant that games weren’t smooth. After a couple display firmware updates by Sharp we were able to manually configure the monitor to run at 60 Hz using the display’s built-in controls (Choose Menu > Setup > DisplayPort STREAM > MST > SET). Basically you had to use Multi-Stream Transport (MST) with DisplayPort to get two 1920 x 2160 images which are then combined to produce the final 3840×2160 image on the display. AMD, Intel and NVIDIA all were able to support this functionality in their drivers, but there were glitches along the way and they were pretty bad at times. The last thing you want to see when you fire up a game is that only half your display is working. In order to produce a 4K Ultra HD display with a more user friendly 60Hz refresh rate, monitor makers are moving over to a single stream (single tile) implementation. This means that as long as you are using DisplayPort 1.2-capable graphics solution that you should be able to just plug and play. There is just a single stream to be had, so the video card driver issues that once plagued so many are gone and 3840×2160 at a 60 Hz refresh rate should be standard. One of the first displays to support for 4K resolutions at 60Hz via DisplayPort’s Single-Stream Transport (SST) mode is the ASUS PB287Q. 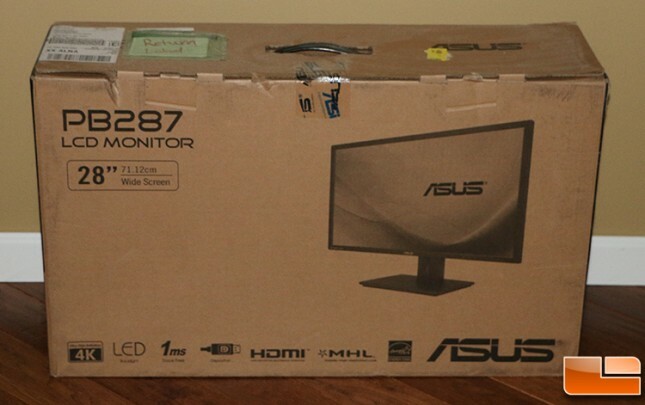 The ASUS PB287Q is a 28-inch 4K Ultra HD display that will be available on June 10th, 2014 for $649 in the United States and $699 in Canada. This price point makes it very interesting as well as the fact that it supports a 60 Hz refresh rate with a single stream implementation. The ASUS PB287Q uses an 8-bit TN panel capable of displaying 1.07 billion colors, but while it is certainly doesn’t offer the same image quality as the IGZO panel on the ASUS PQ321Q or Sharp PN-K321, it doesn’t look bad at all as the picture quality is excellent. ASUS uses dithering to push the bit depth into 10-bit territory and there is even a sRGB mode for photography folks. Gamers will be more impressed by the 1ms GTG fast response time and a 60Hz refresh rate for ultra-smooth gameplay. The ASUS PB287 comes with the a cable clamp for wire management, 3.5mm stereo audio cable, 1 meter power cord, 1 meter DisplayPort cable, 1 meter HDMI cable, quick start guide and the ASUS VIP warranty card. The warranty on this particular 4K UHD display is 1-year for Zero Bright Dot and 3-years on the monitor with advanced replacement service in North America. If one pixel is no longer lit on a display panel, it will become a bright or dark pixel. By ISO 13406-2 standards, ASUS conforms to the acceptance spot level which lies between 3 to 5 bright/dark pixel defects. If your monitor develops enough dead pixels it could be eligible for replacement or repair under the 1-year pixel warranty. This is good to know as this 4K Ultra HD Monitor has a native resolution of 3840 x 2160 and that means there are 8,294,400 pixels that could potentially go bad. 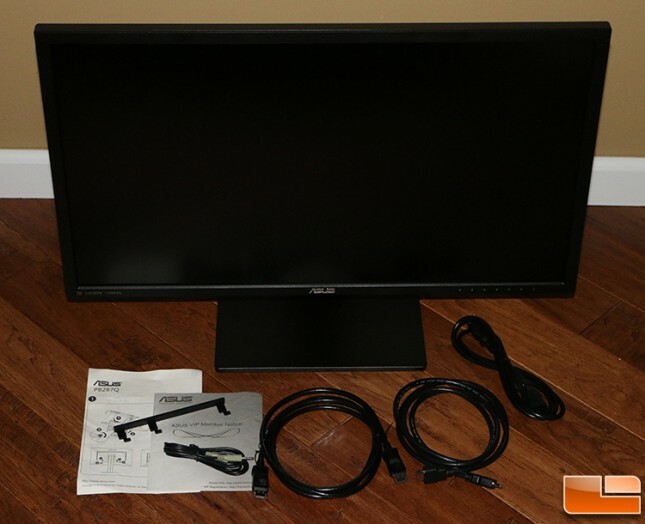 The ASUS PB287Q comes partially assembled and all you need to do is install the base and hook up the power and video source cables to get it operational. There is a VESA wall mount (100x100mm) for those that are looking to mount this display on a wall unit or aftermarket stand. The power supply unit is completely internal on this display, so there is no power brick required for operation. For those that want to use the standard base there is a +20° to -5° tilt and there is also swivel, pivot and height adjustments. The monitor base is very stable and we tried it out on both wood and glass surfaces. When it comes to connections there are a pair of HDMI 1.4/MHL ports, a single DisplayPort 1.2 input, 3.5mm stereo line in and a 3.5mm stereo audio output (that comes from the HDMI or DisplayPort source) that can be used with a headset or something of the like. It should be noted that the ASUS PB287Q supports Mobile High-Definition Link (MHL) connectivity and that means you can plug your smartphone or tablet in to stream your digital content through either of the HDMI inputs. There is also the power connection that is located on the other side of the bottom of the display (not pictured). All of the inputs and outputs are located along the bottom of the monitor and nothing is on the back in order for this monitor to be wall mounted. Is the ASUS PB287Q firmware upgradeable? Yes, but it is only possible at the service center for the time being due to the software utility that is required to do the firmware update procedure through one of the HDMI/MHL ports. The bezel around the ASUS PB287Q is fairly narrow and the matte finish doesn’t show finger prints that badly. 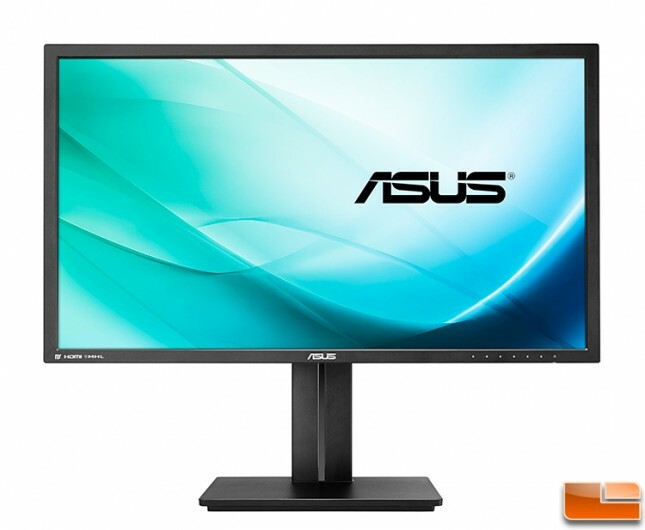 The ASUS On-Screen Display (OSD) is accessed by pressing one of the six buttons located on the back of the monitor. These buttons are then used to navigate the display options. Now that we have the basics covered, let’s try this monitor out!